You know I have a weakness for 3D paper anything, so when I saw an instructional video for origami rabbit cups designed by Jacky Chan at Origami Spirit, I had to try it. The video moves along briskly so I had to rewind repeatedly, but I prevailed. Hey, now that nobody uses tape anymore, is it still called rewinding? What's it called? But I digress. Go fold some Easter bunnies. 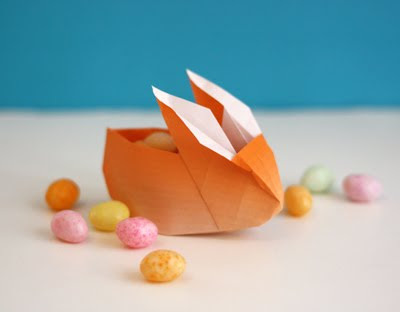 If you use 6" origami paper, an egg will fit nicely inside. good question, but i'm old enough to know what you meant. thanks for this, want to make these for my family for easter! that is absolutely the cutest thing i've seen today! where do you find all this stuff???? I'll have to try those with my boys! They love origami! Oh wow how cute is that bunny?! I have to make me one of those... Thanks for sharing the link! very cute :) love it! Love the bunny—will have to try that. btw, "rewinding" is called scrubbing. I know, what a weird term. Thanks so much for this idea. I'll have my older son whip up a bunch for the younger's bday party next week. Most excellent--entertaining & practical. Couldn't have been more timely! I made one!! It was a little tricky at the end but I finally did it. Thanks for sharing. This is a super idea - does anyone know if it is large enough to hold an Easter egg? E'clair, this bunny (if made with 6" origami paper) is just the right size for an egg. Thank you! I knew I saw these somewhere on the internet, but couldn't find them again.I made other origami rabbits, equally nice, but thanks anyway! Thanks for sharing. What a great idea for an Easter egg holder. Would be cute to have one by everyone's plate for our Easter lunch. Love 'em. Have to try this one! Thanks for another great find. Always enjoy your orange goodness! I used 12"x12" scrapbook paper to make the bunnies, and they turned out perfectly! They are just big enough to have a little green Easter grass and a plastic egg filled with goodies. I'm an avid howaboutorange reader and always love your posts!